If Measure G passed, SDSU expects to need $550 million to build a new stadium and begin preparing the land. SDSU officials have repeatedly promised they will not raise student tuition or fees, but they are uncertain or secretive about how exactly everything would play out. San Diego State University makes a good case for why it wants to expand into the city-owned stadium site in Mission Valley. The university has a harder time explaining how it will pull it off. This fall, city voters will be asked to choose between two ballot measures meant to force the city to turn over all or part of the Qualcomm Stadium site. They can vote for Measure E, SoccerCity, which puts the whole site in the hands of private developers. They can vote for Measure G, known as SDSU West, a plan driven by university boosters in response to SoccerCity, which gives the university or one of its affiliates a 20-year option to buy the land. Or, voters can reject both plans, keeping the site in limbo. Of those options, SDSU wins so long as SoccerCity loses, because if SoccerCity wins, the university’s expansion plans for the area would have to fit into SoccerCity’s. If both measures fail, SDSU can settle in for a longer game where it can seek to control the land while the city goes through a public process to offer the land to bidders. But what happens if Measure G passes – is SDSU the dog that catches the car? Right off the bat, the university expects to need $550 million to build a new stadium and begin preparing the land. SDSU officials have repeatedly promised they will not raise student tuition or fees, but they are uncertain or secretive about how exactly everything would play out. In a normal year, that may not matter so much. Higher education has long been an intrinsic good in California. Among the 23 California State University campuses, San Diego’s is a star. Tens of thousands more students try to attend SDSU than the university can admit each year, and the university is now pulling in $134 million a year to do research. But SoccerCity has put SDSU on the defensive by trying to take control of the Mission Valley site, the most logical place for the landlocked university to expand from its existing 288-acre campus. SoccerCity argues it can wring profits out of the site quicker, in the form of property taxes for the city. The university remains coy or perhaps just uncertain about how and when it would actually transform the site. In early 2016, SDSU’s chief financial officer, Tom McCarron, told a SoccerCity investor in an email that the university wouldn’t need student housing in the near future and wouldn’t want units in Mission Valley. In spring 2017, Bob Schulz, the university’s vice president for real estate assets, said the university would build a new football stadium soon but wouldn’t need the whole site for another 30-50 years, though he quickly walked back that statement. Now, the university is talking with more clear and consistent urgency. 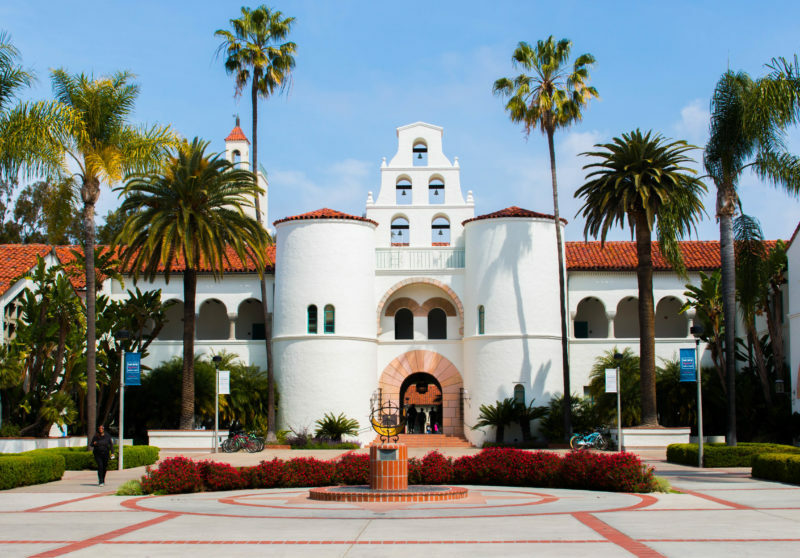 “The university has needs today – demand today for housing, demand today for research space,” Gina Jacobs, an SDSU assistant vice president, said in a recent interview. SDSU’s current vision for the site is a mix of things, including, of course, a new stadium. But renderings for the site also envision apartments anyone could live in, a park along the San Diego River, a hotel that could be used by the university’s tourism and hospitality program and a smattering of new academic and research buildings. The first phase of the project is the clearest, and it has a clear price tag: about $550 million. Of that, $250 million is for a new 35,000-seat stadium. The rest, some $300 million, is a hodgepodge of expenses, including the price the university expects to pay for the land and the costs of demolishing the existing stadium, creating parks and preparing the site for other development. The question is how the university will pay for that. The university has pledged repeatedly that it will not raise either tuition or student fees to pay for any portion of the development in Mission Valley, including the stadium. In recent years, the university has used fees to help pay for athletics and for some new construction. This fall, a semester at SDSU is $3,744 – of that, about a quarter is fees, including fees that students have voted to raise on themselves, like a $237 fee that helps pay for the new student union. Besides money from students, universities have a few other ways of getting money, including alumni donations, partnerships with private companies and money from the state or federal government. So far, though, the university has declined to release documents that show its exact assessment of the project’s financials, citing among other things concerns about future litigation over the Mission Valley expansion. SDSU’s athletic director, John David Wicker, said the university’s plan is to build a $250 million stadium it can sustain but the university is still doing its homework. “We just haven’t finished putting all of those numbers together,” he said. One obvious moneymaker is naming rights. Colorado State University, a team that like SDSU is in the Mountain West athletic conference, recently got $37.7 million to name its new stadium in Fort Collins after a credit union. While some people have said SDSU could rightly expect to get that, Wicker was cautious. He noted that the credit union was rebranding itself at the time and also created a banking partnership with the university, two things that may have driven up the figure. On the other hand, San Diego’s stadium site is at the intersection of two major freeways and SDSU hopes to attract a professional soccer team that will mean more people at the stadium for more games that just the college football season. The picture for how to cover the $300 million in land acquisition and site development costs seems a bit clearer, though it’s still not clear how much exactly the university plans to pay for the land itself. The whole Mission Valley stadium site, which SDSU only wants a part of, is valued at $110 million. 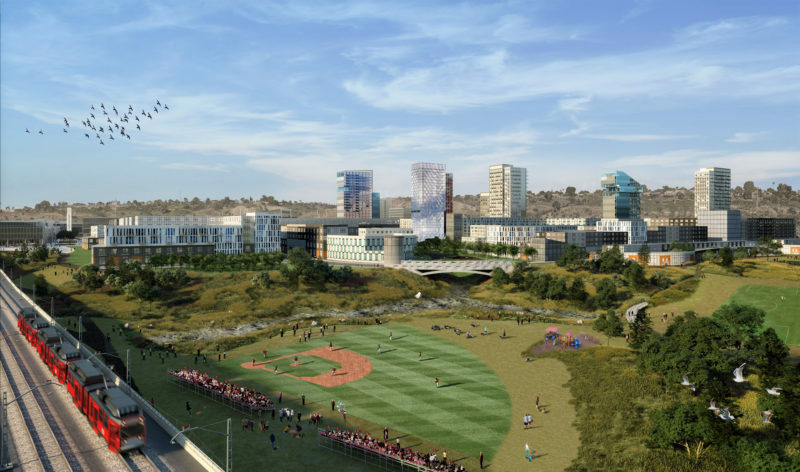 The university’s real estate consultant, John Kratzer, CEO of JMI Realty, has experience with big, long-term projects, notably the master plan that ultimately created Petco Park and redeveloped a huge swath of downtown San Diego. Ultimately, much of what gets done at a college costs students something, somewhere along the line. How can SDSU promise now, years before anything is built, that nothing it does in Mission Valley will cost students an extra dime? Kratzer said JMI has run a series of models analyzing the risks to students if the university spends $300 million on the land, river park and site preparation. He said the model spans 15 years, includes one recession and assumes the university is only able to partner with developers to build about half the housing units it plans to. “I believe it’s a pretty conservative model, and if I’m right – if I’m right – the likelihood that the student fees or the need for rescue capital or whatever comes into play is pretty low,” Kratzer said. If push comes to shove, SDSU can build housing units and force students to live in them, though Kratzer said his model also does not rely on that. The university plans to work with private partners to develop Mission Valley. These deals, known as public-private partnerships, shield universities from some risks and can help prop up a university’s bottom line. SDSU expects to get over $200,000 this year from a new dorm built this way by Alabama-based Capstone Development Partners. “The university is behaving like a private buyer of this real estate,” Kratzer said. Still, certain kinds of deals, even traditional borrowing, can take universities out of their own driver’s seat. Several years ago, a community college in Florida fell behind on promises it made when it borrowed money to build new dorms. After investors scrutinized its operations, it promised investors it would raise student room fees to the highest level the market would bear, Inside Higher Ed reported. But what about the research and academic buildings the university wants to build? The university is less clear about exactly what will happen when or how. “They will finance those in a variety of ways, and all of that will be determined on a case-by-case basis in the future,” Kratzer said. SDSU supporters can quickly rattle off a number of reasons for why they need the land. Their main point is that the university is landlocked atop a mesa on the city’s eastern edge. That physical constraint doesn’t serve the university well. “If you don’t build any capacity, it’s going to be uglier than if we took the risk of trying to do this,” said Karen Zamarripa, a higher education consultant who spent 25 years working for the Cal State system. It’s already ugly for tens of thousands of students who are qualified to get into a Cal State but are turned away from their college of choice. Over the past 20 years, the number of eligible students applying to SDSU has tripled to nearly 70,000 students but enrollment has not kept pace. The university’s “build it and they will come” mentality, though, is limited a bit because it doesn’t completely control its fate. SDSU can’t, in and of itself, buy land or begin hiring new professors and enrolling new students. For that, it needs approval from the Cal State system. SDSU is one biggest campuses in the system, but its 35,000 students are only still a sliver of the 480,000 Cal State students across the state. Some Cal State campuses don’t turn away qualified students, so in theory the system could try to send students to those other campuses, but several people familiar with the Cal State system said the state likes to expand where there is student demand. “The notion is it tries to provide spots for students and if you have a student that wants to come to San Diego State, you’re not very likely to get them to go to Sac State, so you try to respond to the pressure where it is,” said Stephen Weber, a former SDSU president. The system seems open to that idea. In July, the Cal State board of trustees endorsed the SDSU West ballot initiative, signaling that if the measure passes, the system would like to buy the land from the city. And the new chairman of the Cal State board Adam Day, couldn’t be a better ally. He’s the son of a former SDSU president. But the system has struggled for years to get the resources it needs. This year, the governor approved an extra $120 million so the system could enroll 3,600 new undergraduates, but that was all one-time money that will expire in four years. The state spends about $8,600 per year to send a Cal State student to college full time; an in-state SDSU student pays about $7,000 a year in tuition and fees out of pocket or with the help of other financial aid. SDSU argues it’s wrong to compare the millions it will spend on the Mission Valley site to $0 because it can’t just stop building new projects even if it doesn’t expand – it will have costs whether it stays in the same place or not. In the past five years, the university said it has spent more than $500 million on capital projects, including classrooms, residential and mixed-use buildings, including some deals with private partners. Jacobs said the university has 500,000 square feet of off-campus research space that it leases – if it owned more land, it wouldn’t need all that. Likewise, Kratzer said thousands of students live off campus who could live in university housing. Also, despite Cal State’s financial challenges, it still has deep pockets. It had $9 billion in revenue last year, carries over $6 billion worth of debt on its books and has good monthly liquidity, according to a recent report by Moody’s Investors Service. That, of course, doesn’t make the system or SDSU immune from the economy. SDSU’s new South Campus Plaza took two decades to build and was subject to many of the woes any real estate project faces. SDSU is also not stranger to expansion efforts. It has a campus in Imperial Valley, an outpost in the country of Georgia and a satellite campus in North County was so successful it turned into its own college, Cal State San Marcos. University boosters talk about how an expansion into Mission Valley is a natural thing, albeit a thing that was on hold while the Chargers were deciding what to do, lest it look like the university was helping to push them out of town. In 2009, when Weber was president, the university and city talked about a deal that would have allowed the state to take control of some of the Mission Valley land to give the university a place to grow. Nothing came of it then and even key people involved in the talks are hazy on the details, but now, SDSU boosters talk about it all the time. See, they say, the university has long been interested in a Mission Valley expansion. Still, there are some boosters who hold out hope that the city would eventually give the land to the university. Kratzer said his business partner John Moores – the former owner of the Padres and a major SDSU donor – was in that camp. They point to generous deals the city had to help UC San Diego grow, including nearly 500 acres of land. SDSU officials quickly shut down that kind of talk, because one of its talking points now is that it will pay the city a fair price for the land. They don’t want a giveaway. Former Mayor Jerry Sanders, who was involved in the 2009 talks, said because of the recession, providing the land for free was not in the cards at the time. “You just couldn’t give it away at this point, especially with the shape the city was in,” he said. Still, part of the risk, however small, that students face from the expansion is in part a result of the city trying to get money for its own public land, whether it be from SoccerCity or SDSU.